Every day, billions of people making an unimaginable number of searches through search engines. Complex algorithms seek to recover in the shortest possible time and with greater sorrowfulness the requested information. We may venture that a good 80% of Internet users interact with the web through these powerful applications. But the engines are much more, they are true and proper systems for the analysis of user behavior, they practically know every thing about us. Forecasting systems and relationships engine have been developed to improve the searches to be able to guide the user during the navigation. Easy to understand how important are search engines in a digital environment, they are an inprescindibile element that accompanies each user in their research. Of course, as always, we must take in care the compromises that any technology solution offers. In the case of search engines who guarantees that the proposed results are not deliberately manipolated some for reasons that may be the most different? In some cases the results of a search are affected by various government related factors, and some specific information can be excluded from them. The suppression may be local to a country, or global to all search enfine results. The exclusion of results has been documented in the past, very interesting is the report Localized Google search result exclusions which investigated certain web material banned in various countries. Easy to understand how in the name of the business big companies like Google must bow to the interference of governments in order to continue to operate freely in the host country. In 2002 all the references to Google in China were even re-routed to Baidu, a China-based search engines, this means that every time a users in China entered Google.com, they would end up on Baidu.cn, who benefited from Google’s marketing and name recognition of it competitor. The economic impact was devastating for Google, its market share to third risusse is to the benefit of its competitors who reached the 70% point of the internal market and the revenues began to climb the adjacent markets such as Japan. It is impossible to compete with such interference and it is understood as a private company can really little. I understand from a business point of view the response of the serach engine companies in reaction to government law or government pressure but I believe that it must change and to this we need a strong collaboration beetwen governemte and service providers of all the world. According to Smith companies like Google have just to inform the public about the censorship practiced but not openly take sides against any government decision. In countries where human rights are daily violated, these assertions thunder as a fully support to dictatorial policies that use of censorship to stifle dissent in the bud. This censorship applied in country like China suppresses any writings and media that express dissent against the central government, hiding related materials in search engine results. We are facing with a serious violation of human rights in the name of the business. Consider that obscuring operations are used by governments not to enforce copyright restrictions, but to impose a raw censorship of political or religious material that is considered to be offensive. It is clear that so far Google has been discussed and cases related to it since the engine is the main player in the world and having a lot of information available for it. The situation is quite common to all major search engines, even in this there is to say that Google is one ofthe same companies that seek to implement policies in the name of transparency. The consorship proccess it not so easy for different reason. First of all there is the concrete risk to fail to produce reliable search results. Consider the every time a content is banned all its references have been impacted. Countries with greater censorship might produce lower quality search engines, but primary companies like Google and Microsoft, can avoid this problem accessing to uncensored data and mitigating the indirect effects of censorship. Search engines are of high interest to censors, but cannot sensibly be held responsible the several billions of pages present in Internet. The market for search engines is in fact an oligarchy in which the risk of cartel agreements is very high. In particular I found very interesting results produced by the second of the two portals. It contains data related to the “anomalies” in accessing the network. These issues are analyzed using different axes of analysis, such as geographic location and type of intervention performed (eg political, social, conflict / security, Internet tools). The information is produced with detailed reporting that goes along with maps that make it attractive graphical representation of the phenomena. 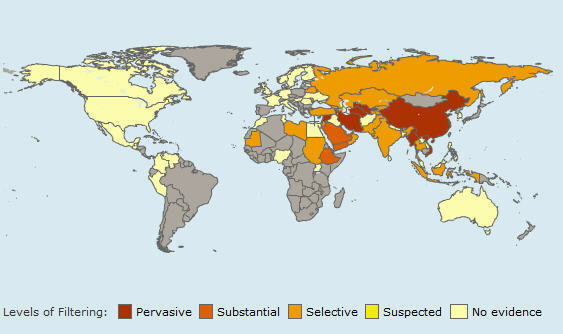 As you can see the situation in countries such as China and beyond, is truly alarming. Internet is used as an instrument of government propaganda and censorship as a gag to everyvoice of dissent. We must consider free internet access as a fundamental human right in cyberspace, recently, the United Nations declared “Right to Access” to Internet as Human Right. For instance, right to speech and expression, right to privacy, right to know, etc cannot be violated by any CMS Project. United Nations must expand Human Rights Protection to many more issues considering anyone of this violations. Don’t forget also that censorship can be placed also for business purpose. Sometimes for example local businesses that fear foreign competition and will work to hide those company web site from search engines results. It is happened for in China where Google China block searches relating to the French hypermarket chain Carrefour to advantage a local business. It has no sense to promote human freedom closing the eyes on corruptions events, on the direct correlation that there is between corruption and policy to implement detailed traffic filtering. In fact, then how can we combat these forms of censorship? Another possibility is the study of structures of alternative communications channels able to by-pass filter. It was a long discussion on the subject, many theorists and groups of hackers are working on solutions of various kinds, but they really are in the high seas due to the refusal of government support and non-availability of adequate budgets. Like user we have to make the same pression on those companies. Users are the soul of business, their choice is the business … let’s use, if we can, only search engine that avoid any kind of consorship.